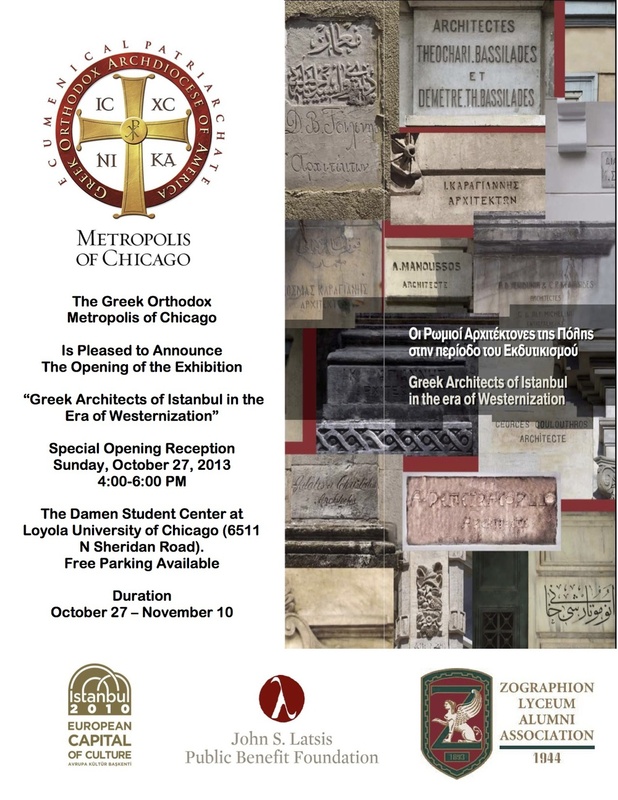 CHICAGO: The Greek Orthodox Metropolis of Chicago is pleased to announce the opening of the exhibition, “Greek Architects of Istanbul in the Era of Westernization,” which focuses on the contributions of Greek architects to the modernization of Istanbul (ancient Constantinople), Turkey. A special opening reception will take place on Sunday, October 27, 4:00-6:00 p.m. at the Damen Student Center at Loyola University of Chicago (6511 N Sheridan Road). The exhibit will remain open to the public through Sunday, November 10, 2013. This exhibition makes its American debut at Loyola and is sponsored by the Metropolis. It was organized by Zographion Lyceum Association of Istanbul and co-funded by Istanbul 2010 European Capital of Culture and the John S. Latsis Public Benefit Foundation. Opened in Istanbul in 2010, the exhibition has traveled to six cities in Greece, including Athens and Thessaloniki. A large number of Greek architects greatly contributed to Istanbul’s architecture. Today the buildings in certain districts of Istanbul are still standing with all their magnificent forms and the splendor of their unique architectural character. From large state and commercial buildings to smaller residential buildings, prominent Greek individuality is expressed in the photographs. The exhibition highlights the contributions of these architects for whom we have very little, or sometimes, no information. Their works, however, played a great role in the westernization of Istanbul. The exhibition traces the important contributions of these Greek architects to Istanbul’s modernization process and serves as a guide to the city’s remarkable past. History unfolds through building façades, designs, plans, and projects as well as the biographies of those who envisioned, designed, and carried out the work. This collective effort, begun in 2008, highlights this otherwise unknown imprint of the Greek Orthodox community on the cultural life of modern Istanbul. The exhibition is a captivating way to get to know the diversity of buildings and their innovative uses, and the life of families and eminent personalities who lived there. Additionally, the exhibition features everyday people who brought life to this built environment for so many decades by living together in peace and practicing a multicultural coexistence.